In this still image taken from a December 2016 video released by the Afghan Taliban, U.S. national Caitlan Coleman and her Canadian husband, Joshua Boyle read a statement urging then-President-elect Donald Trump to negotiate to secure their release. A couple held hostage for five years by a Taliban-linked extremist network in Afghanistan was safely back in Canada on Saturday after what the husband described as a harrowing firefight during a raid to free the family. In a video released by Pakistan's military that was filmed before he left that country for home, Joshua Boyle said Pakistani security forces positioned themselves between the hostages and their Haqqani network captors to keep the family safe amid the gunfire. "A major comes over to me while I still have blood on me. The street is chaos and he says to me, `In the American media they said that we support the Haqqani network and that we make it possible. Today you have seen the truth. Did we not put bullets in those bastards?''' Boyle recalled, appearing beside his wife and children in the video. The circumstances under which the video was recorded were not immediately clear. Boyle, his American wife, Caitlan Coleman, and their three children were rescued Wednesday, five years after the couple was abducted in Afghanistan while on a backpacking trip. Boyle said the kids, who were born into captivity, were adjusting to a new reality after growing up amid a group of ``pagan'' bandits. "These are children who three days ago they did know what a toilet looks like. They used a bucket,'' Boyle said in the video. ``Three days ago they did not know what a light is or what a door is except that it is a metal thing that is locked in their face to make them a prisoner. 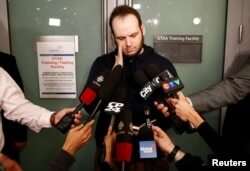 Joshua Boyle speaks to the media after arriving with his wife and three children at Toronto Pearson International Airport, nearly five years after he and his wife were abducted in Afghanistan in 2012 by the Taliban-allied Haqqani network, in Toronto, Oct. The birth of the fourth child had not been publicly known until then. Pakistan's Foreign Ministry spokesman, Nafees Zakaria, said the rescue raid was based on a tip from U.S. intelligence and shows that Pakistan will act against a ``common enemy'' when Washington shares information. Earlier, on a flight from London, Coleman, who is from Stewartstown, Pennsylvania, sat in the business-class cabin wearing a tan headscarf. She nodded wordlessly as she confirmed her identity to an AP reporter on board. Next to her were her two elder children. In the seat beyond that was Boyle, with their youngest in his lap. U.S. State Department officials accompanied them. 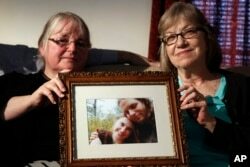 FILE- Linda Boyle, left, and Lyn Coleman hold a photo of their married children, Joshua Boyle and Caitlan Coleman, June 4, 2104, who were kidnapped by the Taliban in late 2012. Boyle provided a separate, handwritten statement then expressing disagreement with U.S. foreign policy. "God has given me and my family unparalleled resilience and determination, and to allow that to stagnate, to pursue personal pleasure or comfort while there is still deliberate and organized injustice in the world would be a betrayal of all I believe, and tantamount to sacrilege,'' he wrote. Washington considers the Haqqani group a terrorist organization and has targeted its leaders with drone strikes. But the Haqqani group also operates like a criminal network. Unlike the Islamic State group, it typically does not execute Western hostages, preferring to ransom them for cash. A U.S. national security official, who was not authorized to discuss operational details of the release and spoke on condition of anonymity, said the U.S. obtained actionable information, passed it to Pakistani officials, asked them to interdict and recover the hostages -- and they did. The operation appears to have unfolded quickly and ended with the raid, the shootout and a captor's final, terrifying threat to ``kill the hostage.'' Boyle told his parents that he, his wife and their children were intercepted by Pakistani forces while being transported in the back or trunk of their captors' car and that some of his captors were killed. He suffered only a shrapnel wound, his family said. Boyle's father said his son did not want to board the plane because it was headed to Bagram Air Base and the family wanted to return directly to North America. Another U.S. official said Boyle was nervous about being in ``custody'' given his family ties. They include Kevin King, 60, a teacher at the American University of Afghanistan in Kabul who was abducted in August 2016, and Paul Overby, an author in his 70s who disappeared in eastern Afghanistan in 2014.